Watch out – ‘Disaster’ is coming! This brand new large-scale piece by master printmaker Martin Langford will be released for sale at 9am on Saturday 15 September at an exclusive pre-show discount. Don’t miss your chance! To celebrate the opening of Martin’s major new solo show, ‘This Is Us’, at For Arts Sake later this month, we are delighted to announce the online release of a spectacular new work by the acclaimed British artist. 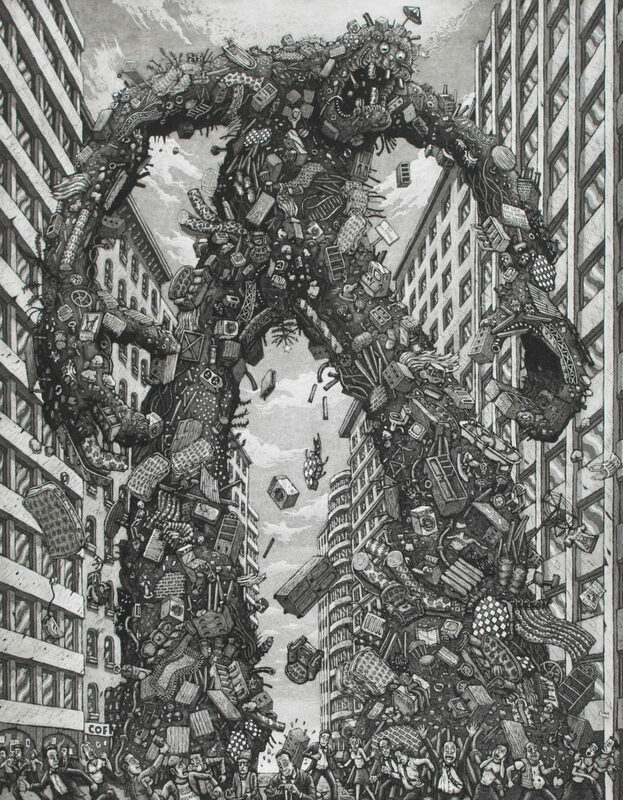 The monumental ‘Disaster’ is a fantastic, intricate etching that confronts the relentless consumerism of our modern age. The artwork comes in a limited edition of 100, signed and numbered by the artist, and is sized 74 x 59.5cm. 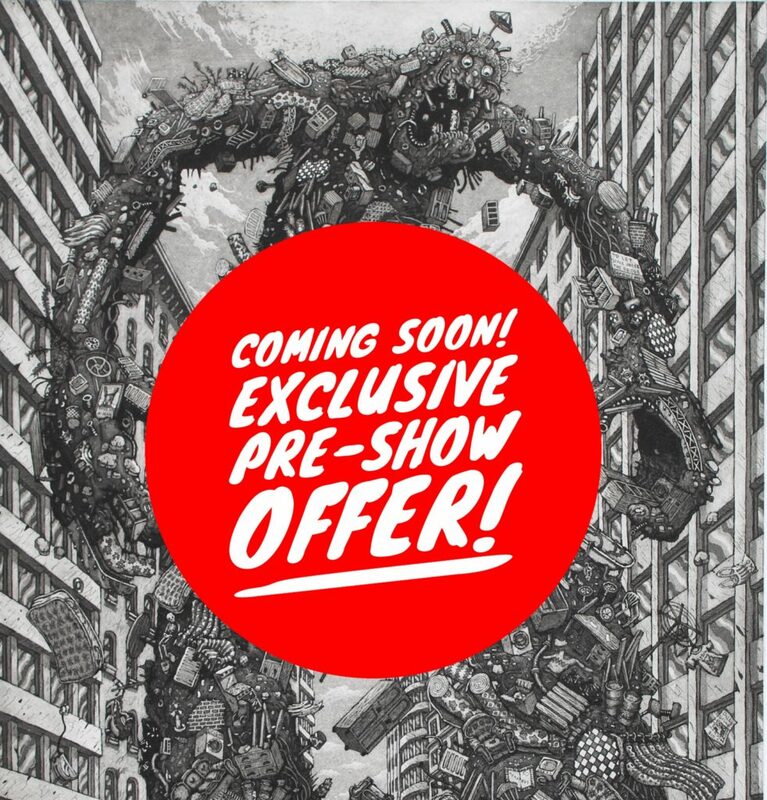 Click here for the link to buy this hugely collectible artwork by one of the country’s leading printmakers, and keep an eye on our social media feeds (Instagram, Twitter and Facebook) for news on when the offer goes live. A member of the prestigious Royal Society of Painter-Printmakers, Martin studied Fine Arts at Exeter and under the renowned David Glück on the Advanced Printmaking MA at Central St Martin’s. He was drawn early on to the graphic black and white quality of etching, and cites among his inspirations the late comic book author Harvey Pekar, Robert Crumb, Georges Seurat and M.C. Escher. Martin has exhibited widely and internationally, including in New York, Chicago, Washington and Taiwan. Remember – discounts go live here at 9am on 15.9.18! For more details and information email the gallery at [email protected] or call us on 020 8579 6365. For exhibition dates and details click here.